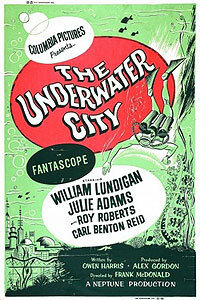 The Underwater City (1962) - Sci-fi-central.com. USA  1962  78m   Directed by: Frank McDonald.  Starring: William Lundigan, Julie Adams, Roy Roberts, Carl Benton Reid, Chet Douglas, Paul Dubov, Karen Norris, Kathie Browne, Edward Mallory, Edmund Cobb, Roy Damron, George DeNormand, Paul Power.  Music by: Ronald Stein. This was one of the last science-fiction adventure relics from the 1950s to early 1960s before the JFK assassination changed the mood of this genre to something less innocent and more grim. Lovely Julie Adams portrays a psychologist who tests engineer William Lundigan to ascertain that he can lead a construction effort to build the world's first underwater metropolis. After completion, the couple plus several others, move down to the city, until it is discovered that it was built on a fault line, creating climactic chaos. An interesting idea, shot in color, is hampered by the fact that it was filmed entirely indoors, on sound stages. The underwater scenes were created by filming through double-paned, water-filled aquarium glasses. Also a laundry alert: Adams wears the same orange outfit 3 times! Karen Norris gives a good performance as a nutritionist, spouting several intriguing ideas of why one should live underwater, while the others (although Lundigan is sausage-stuffed into his diving gear) are competent. Review by ronnie [IMDB 17 April 2001] from the Internet Movie Database.